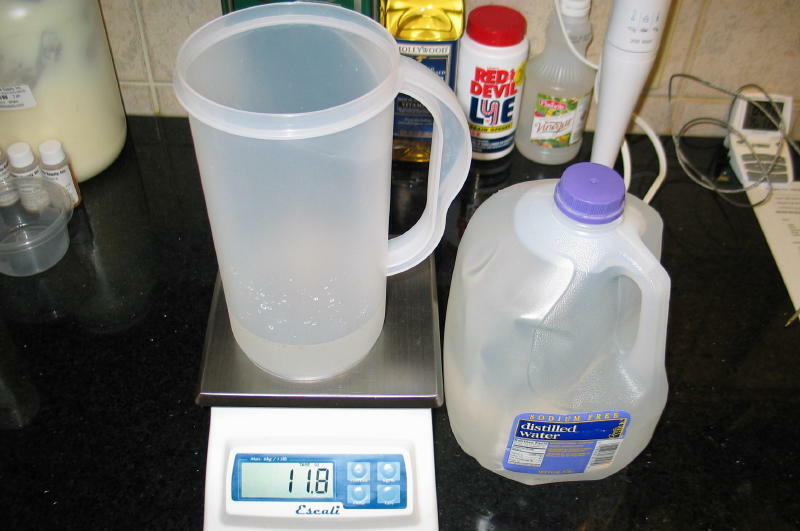 Measure 11.8oz Distilled Water into your tall pitcher. 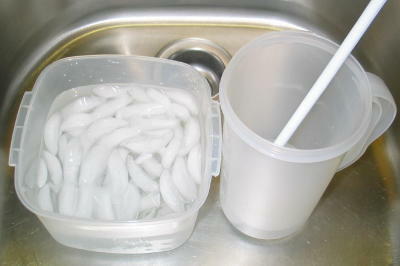 Note: use cool or room temperature water, never warm or hot water. 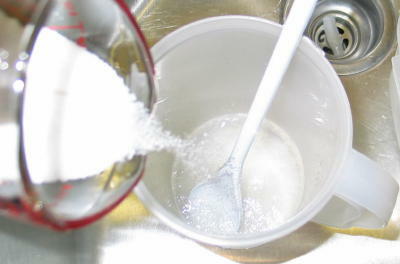 Add Sea Salt & Sugar to your water. 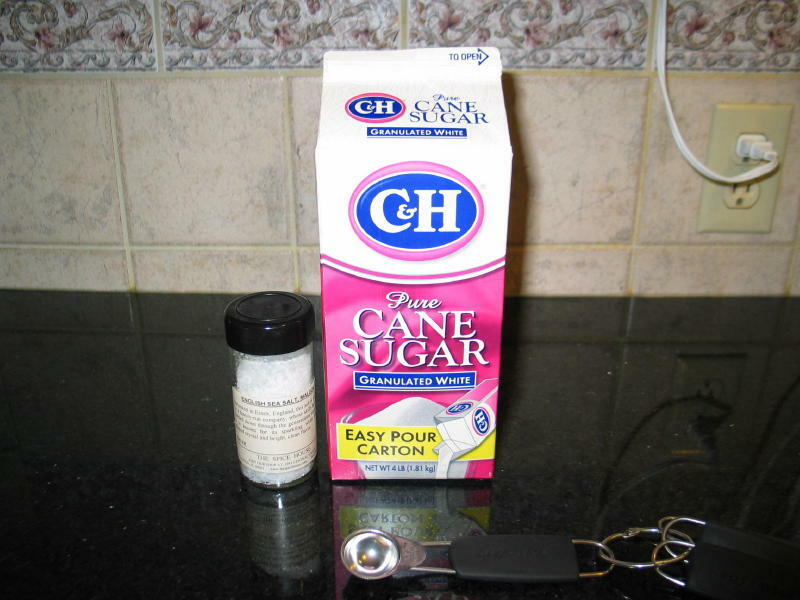 Note: These must be added before you add the lye or they will not mix. 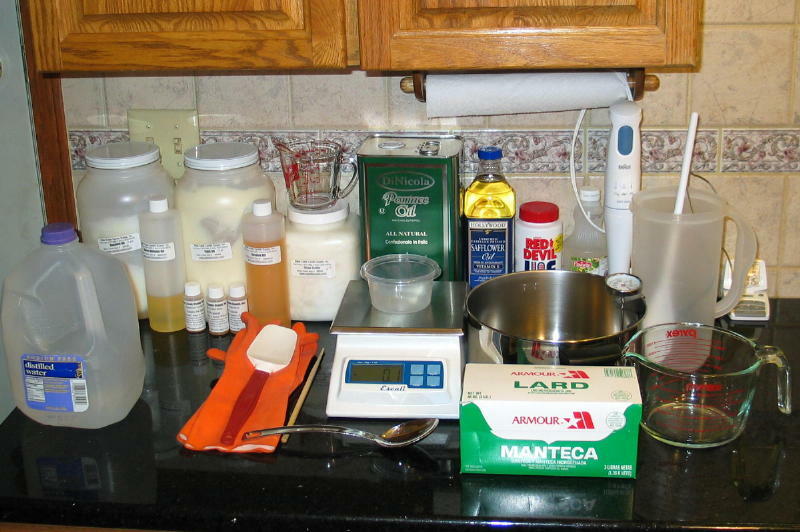 Note: Always wear protective goggles, gloves, long sleeves & apron when using lye. 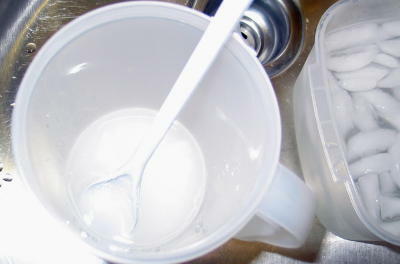 Also keep a bottle of Vinegar nearby to neutralize and lye water spill. 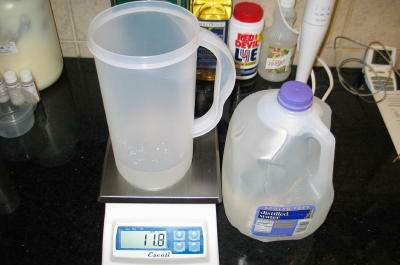 Get ice & water to help speed the cooling of your lye mix. This step is optional but I find if I do it this way the lye mixture will be ready to go by the time i have the oils measured and melted. Carefully add lye to water (never add water to lye). 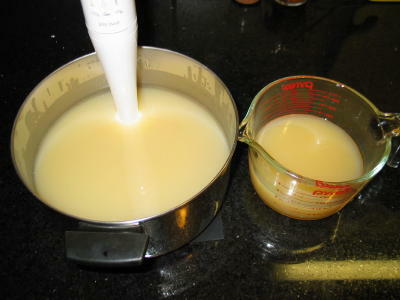 Stir well until completely dissolved being careful not to breath any fumes in. 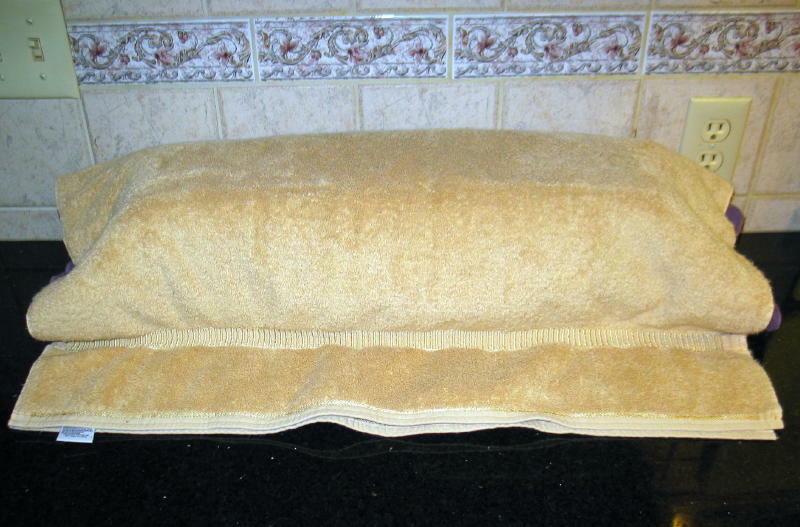 Note: It is preferable to mix lye outside making sure wind is blowing at your back and that no children or pets are near by. The lye water will get to 210-220 degrees while you are stirring. 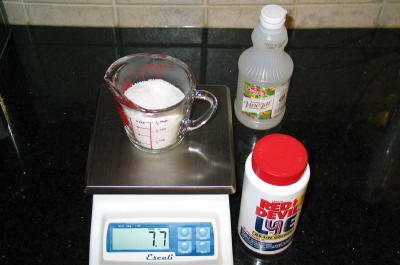 Cool you lye mixture to 90-100 degrees. 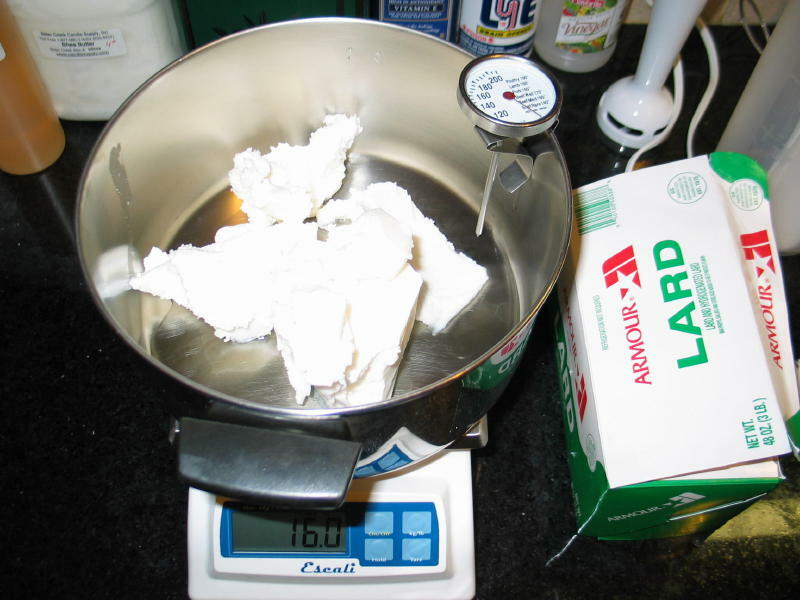 Note: Lard is not necessary and could easily be replaced if you prefer a all vegetable soap. 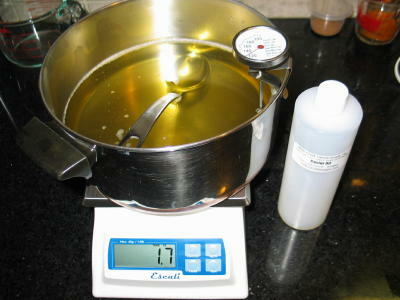 Tip: I always add all my solid oils and butters first & melt them and then add my liquid oils last to help cool the oil mixture. 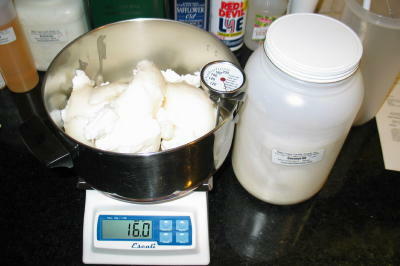 Measure Shea Butter & then melt all the solids on stove over medium to medium low heat. 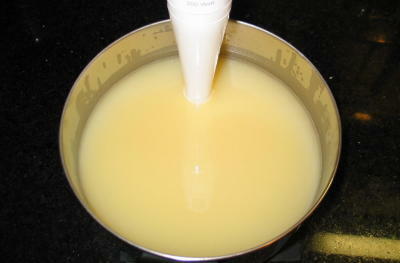 Do not leave the pot while it is melting, stir until there are only small pieces of Shea butter left and turn burner off. 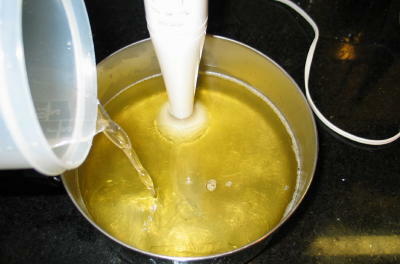 The butter will continue to melt while you are adding you liquid oils. 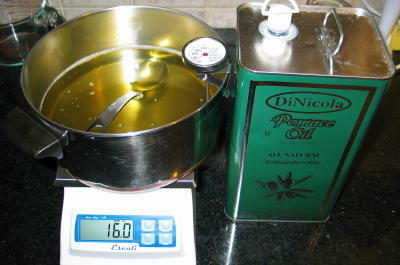 Return your pot to the scale and add 16oz of Olive Oil. Measure 1.7oz of Castor Oil and let oil mixture cool to 90-100 degrees. Add lye solution to oils while using the stick blender just to stir with (not turned on) until the oils have mixed with the lye mix. 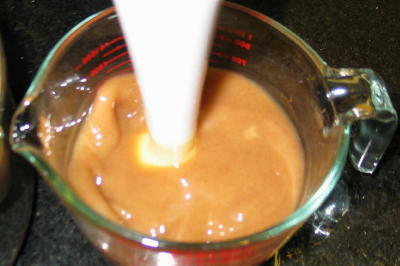 Then you can run your stick blender in short 20-30 second bursts. Add 2ox of Pumpkin Pie Special fragrance oil & gently mix with stick blender off until it is completely incorporated. 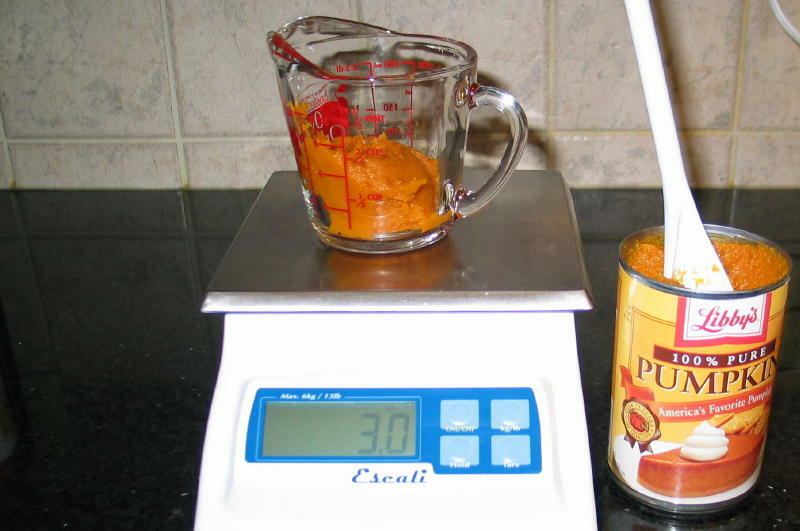 Reserve roughly 1/3 of your mix into a large Pyrex measuring cup. Add 3oz of Pumpkin to your main pot & 2teaspoons of Pumpkin Pie Spice to your measuring cup. 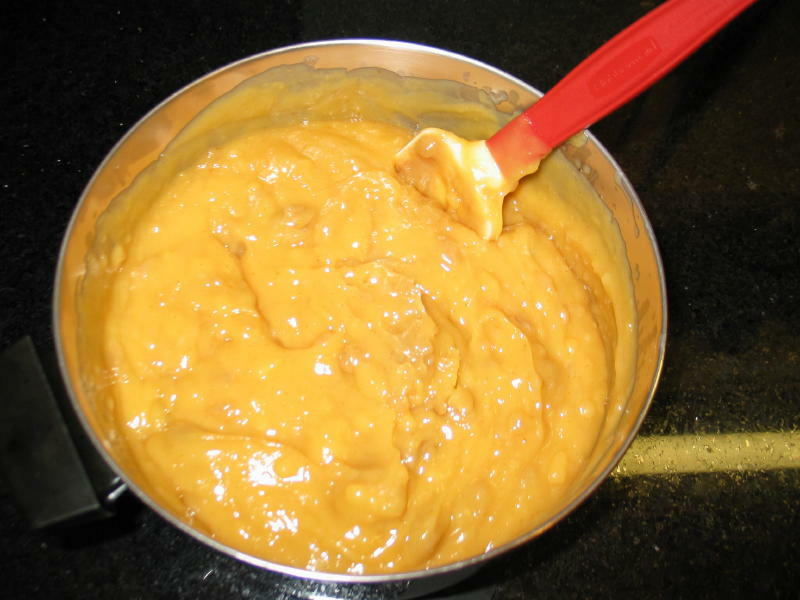 Blend Pumpkin to medium trace*. 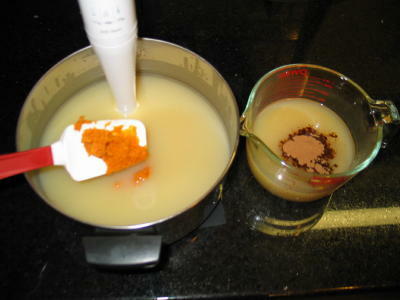 Blend Spice to trace (actually the next time I make this I will use a wire whisk for this as the spice made it accelerate. Trace is when your mixture will not not separate back into oils and water & is best tested by lifting what ever you are using to stir up a bit and letting some drip back into the pot. 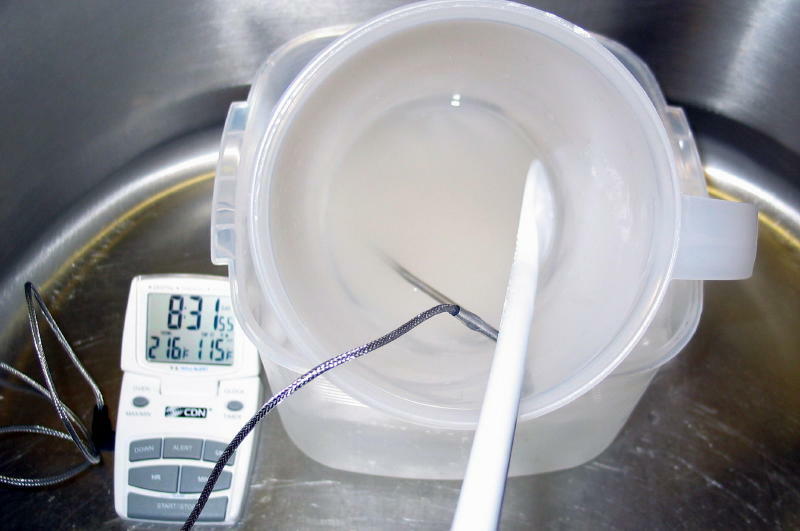 if it leaves a trace for a few seconds before melting in with the rest you have reached trace. Note: If you click the picture on the left you can see the marks left from the stick blender. I would call this a medium trace. 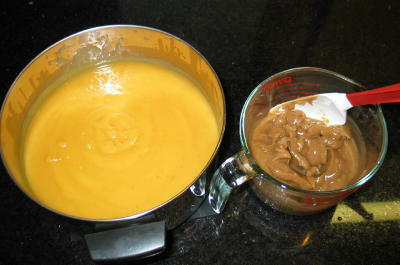 The spice mix on the right accelerated trace and is a little stiffer than I would have liked. 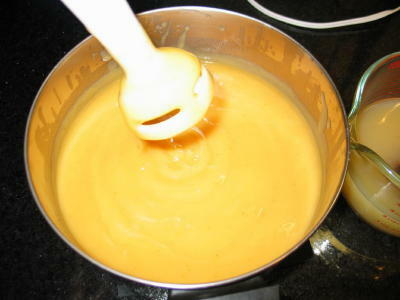 Combine & gently swirl with a rubber spatula or spoon. Less is better than more. Combined mixture ready to add to the mold. 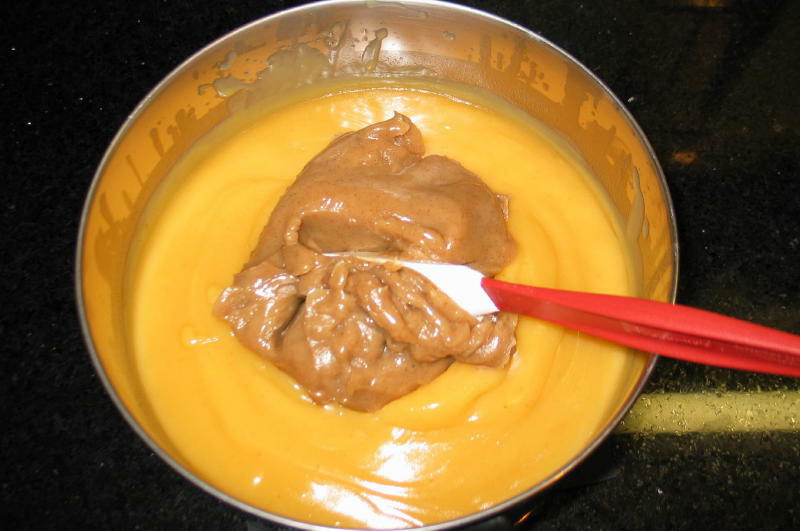 Add to mixture to your mold. 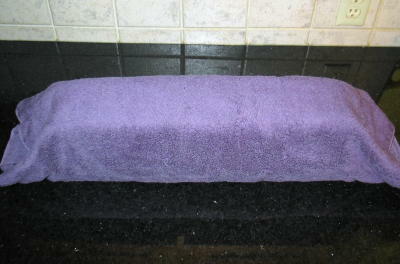 Insulate with old towels or blankets. 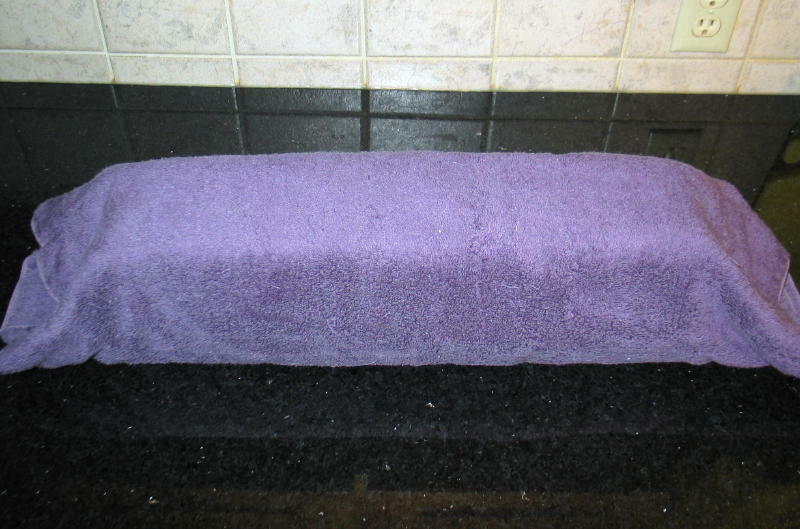 I used 2 bath towels. 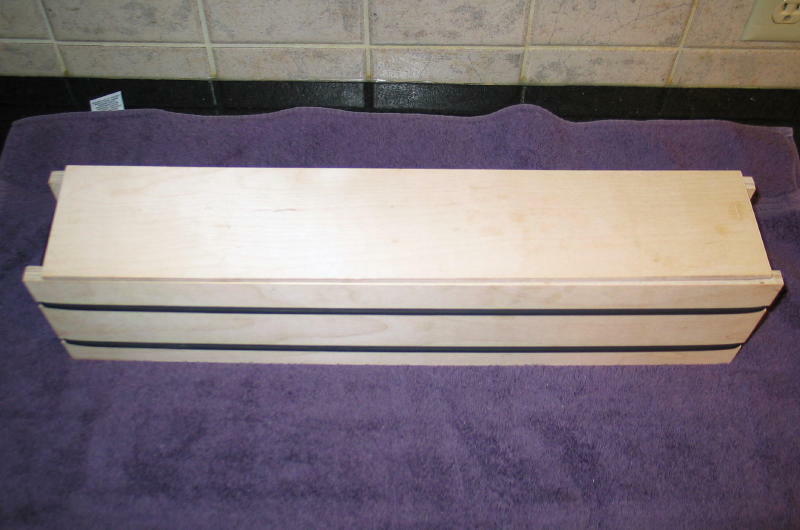 Leave it sit 12-24 hours till firm and un-mold. 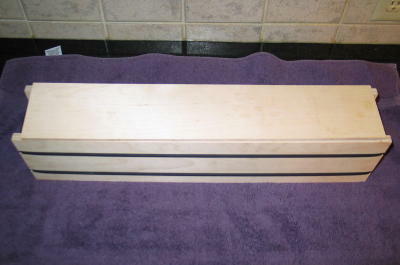 I normally leave the log sit another 24 hours and then slice and bevel the bars. 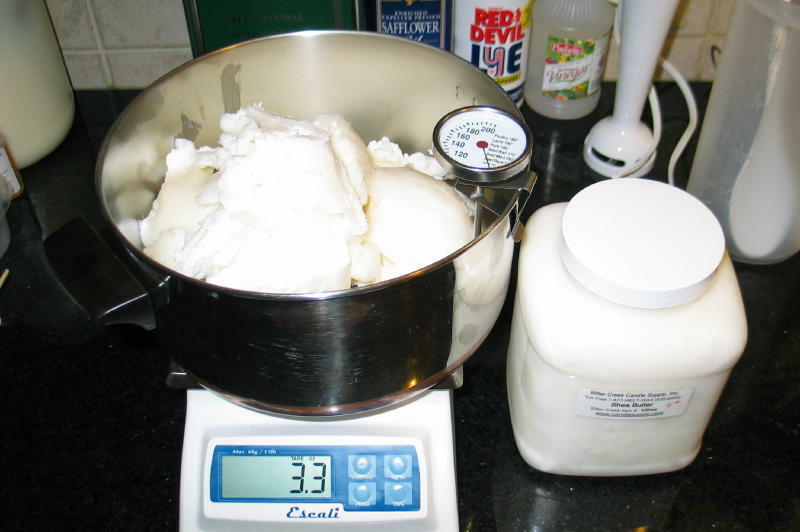 Finished slices are stores for 3-6 weeks to cure & harden. This batch will yield 18 1" thick bars with a cost per bar of $0.65 to $0.80 each.